From this test, we can determine core loss and no-load current (I0) of the transformer. Figure 1.35 shows the schematic diagram of the transformer. The high-voltage side is generally kept open because the current in high-voltage winding is less compared to that on low-voltage winding. In low-voltage side, a voltmeter, an ammeter and a wattmeter are connected to measure the input voltage, no-load current and the core loss of the transformer. Since no-load current is generally small, the copper loss at no-load condition is negligible. The wattmeter reading practically gives the iron loss of the transformer. To measure the induced emf in secondary winding, a high-resistance voltmeter is connected across the secondary to calculate the turns ratio (a). Let I0 be the reading of the ammeter, V1 be the reading of the voltmeter and W be the reading of the wattmeter. The total iron loss depends on the frequency as well as the maximum flux density. 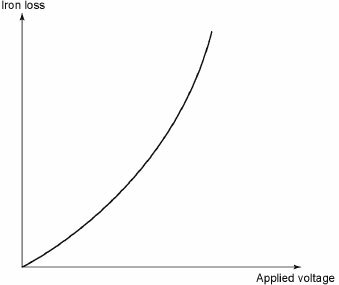 Hysteresis loss and eddy current loss are the two parts of the total iron loss, which are described below. where k1 and k2 are the constants in the above two equations, which can be obtained from the experi-ment. The hysteresis and eddy current losses can be calculated by knowing k1 and k2. Figure 1.36 shows the variation of iron loss with the applied voltage.